Sensor : Canon uses 12.1MP 1/2.3″ CMOS image sensor , the Fujifilm uses newly developed 16.4 megapixel 1/2.3″ CMOS sensor. ISO range : You get more ISO range with Fujifilm S1, + Fuji comes with bright aperture lens compared SX 50 HS, hence you will sure get less noise in HIGH ISO images compared to SX50 HS. Image Stabilization: Both cameras features advance IS system, but Fuji S1 IS is better compared to Canon SX 50 HS. Fujifilm comes with 5 axis IS – The 2-axis optical image stabilization system counters both pitch and yaw movements and the rest 3-axis electronic image stabilization system compensates for roll, vertical shift, and horizontal shift movement types. Canon SX50 HS comes with Intelligent IS – It automatically select from six different modes to optimize image stabilization for the given situation: Normal, Panning, Macro (Hybrid) and Tripod IS for stills; and Dynamic, Powered, Macro and Tripod IS for video. Shutter: Fujifilm features more shutter (Min/Max) range and fast continuous shooting speed upto 10 fps, Canon SX 50 HS limited to 2.2 fps only. Video With S1 you can capture Full HD videos @ 60fps, Canon is limited to 60fps. Display: Fujifilm is better with 3.0″ 920k-Dot Vari-Angle LCD Monitor and Canon 2.8″ display limited to 461K pixels and yes both are vari-angle. So many better features of S1 compared to Canon SX50, and you recommend SX50. 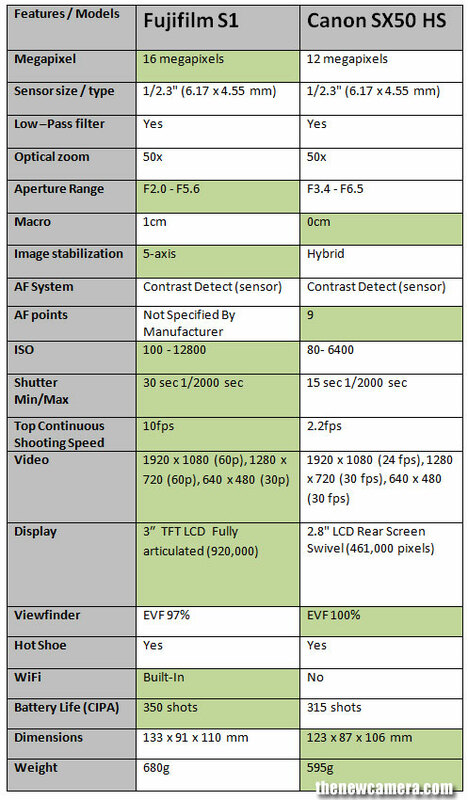 I wish you would explain why you recommend the Canon SX50 HS when the features of the Fujifilm S1 seem to be better in most categories? Seems like the S1 is the better camera. Thanks for the alert I have updated the post, it was a typo error.